Did you think we wouldn’t have a Friday Happy Hour on Christmas Day? Surely you jest. At this moment I’m sure there are many MANY people in DC starting to feel the need (and if you’re reading this, you definitely need happy hour, stat!). So I’ll take advantage of the spirit to get a little nostalgic. I can’t go “home” for Christmas. My parents sold the family home in Connecticut ages ago, and my urban family is in Washington. So when I saw a drink called “My Old New England Home” on Poste’s menu, I got a little teary. Yes, jaded Jenn got teary and ordered a cocktail based on nostalgia for her long-lost childhood. Or at least, the one I stole from watching The Ice Storm (joke, Mom and Dad, joke!!). 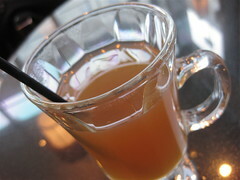 Apple cider mulled with cinnamon and star anise and kissed with rum, this is a pretty delectable warm drink. It’s usually served with a cranberry foam – as I had it the day after the Snowpocalypse they were short, but that hardly mattered. There’s something so comforting about a warm cocktail, your hands cupping the glass, the scent of spice tickling your nose. The best part about winter is mulled cider, anyway! So cosy up in one of the striped banquettes, stare out into the snowy patio, and indulge in luscious nostalgia.